A group of Texas A&M-Galveston marine biology researchers was on standby Monday waiting for clearance to head into Galveston Bay to begin sampling areas affected by Saturday's oil spill. With the reopening of ferry services in Galveston late Monday, Antonietta Quigg, a Texas A&M-Galveston marine biology professor, said she was hopeful she and other scientists with the university would be able to board research vessels Tuesday morning to begin their sampling work. The team of researchers -- which was asked by the Coast Guard to conduct sampling -- will test samples to determine how up to 168,000 gallons of oil released when a barge collided into a ship in the Houston Ship Channel is likely to impact the marine life. Quigg said her focus will be on the water quality and plankton, while other researchers will turn their attention to various parts of the underwater ecosystem. "In terms of plankton, I want to see how [the oil] impacts their ability to grow and reproduce," Quigg said. "Given that they're an important food source, we want to see how they're affected. If they're impacted, then we can speculate about how the fish may be impacted as well." In terms of what to expect, Quigg said she couldn't be sure without knowing more about how the spill clean-up was progressing. "In some ways, it should be similar to previous studies that are out there," she said. "And in other ways, it should be unique. Because it is an estuary, there will be a lot more freshwater that will affect oil and how oil behaves." In College Station, Aggie researchers were receiving near real-time information on currents, waves and winds from a buoy deployed near the spill site as part of the Texas Automated Buoy System, a program sponsored by the Texas General Land Office and managed by the Texas A&M Geochemical and Environmental Research Group. 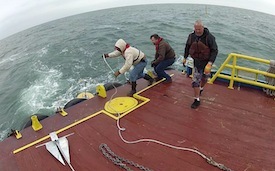 John Walpert, a senior research associate and technical lead with the research group, said the buoy transmits information being monitored by A&M researchers, the Texas General Land Office and a HAZMAT modeling company in Seattle. The data was being analyzed to create oil models to determine where the oil is likely to spread, which could help crews contain it. Terry Wade, deputy director of the Geochemical and Environmental Research Group, which is part of the Texas A&M College of Geosciences, said that, as a chemist, he was interested in seeing toxicity levels from samples collected near the oil spill and comparing those numbers to data from prior to the accident. Keeping the oil from reaching the marshes in Galveston Bay will be crucial to protecting marine and wildlife, Wade said. "While we don't want to have it in the open ocean, it's better than in our marshes," he said. "The marshes are the last place you want it. If it does go out into the open ocean, there are some microbes that can use oil as a food source." Wade said he has had a good working relationship with Quigg and her Texas A&M-Galveston colleagues and expected the two Aggie groups would be sharing and comparing some of the data collected.